Charles Fergus is back. And that’s good news for upland hunters. But where he is now isn’t exactly great news for those of us who cherish the wild places gamebirds exist. Fergus, you might remember, is the author of the splendid 1991 book “A Rough Shooting Dog,” a must-read for bird-dog aficionados, particularly those who cherish their days afield with flushers. Like “A Rough Shooting Dog” Fergus’ new offering — “A Hunter’s Book of Days” — is poignant and entertaining, but this book’s heart and soul is based on an uncomfortable thesis. “You could, I guess, call it a memoir,“ said Fergus as he sat in his newly remodeled farmhouse in northeastern Vermont. “It’s also about the effects of sprawl on the landscape and the environment. “It was sprawl that pushed Fergus from his home covers of central Pennsylvania to begin anew in rural Vermont. It is sprawl, too, that inspired Fergus to be one of the first hunting writers of the 21st century to explore a subject looming over us all, even if we don’t want to think of it. As much as Fergus is every hunter in the bird cover, unable to snap off a shot because of thick vegetation overhead or awkward footing underneath, he is every hunter standing near the interstate exchange, or newly built Wal-Mart watching helplessly as the landscape is transformed quickly from woodlands to pavement in the name of so-called progress. Fergus gives us an accurate, elegant and fresh take on the world of upland bird hunting in the 21st century. It’s a rock-solid effort, spiced with beautifully written passages and entertaining hunting stories about the birds that got away and some that did not. Fergus blends in a pinch of natural history, a whole bunch of dog talk (one of the stars of the book is Fergus’ Springer spaniel, Caillie) and a sprinkle of shotgun discussion. The end result: An entertaining book deserving of a spot in any bird-hunter’s library. Fergus said a friend of his was mildly critical of how much time and space “A Hunter’s Book of Days“ devoted to sprawl and land-use issues. “He wanted the hunting stories,“Fergus said with a laugh. No question, those hunting stories are the treasures of the book, but as important is the subject of sprawl that Fergus firmly tackles. How will bird-hunting survive in the 21st century as interstates are built, big-box retailers push small businesses off the radar, family farms fade out and the once-rural landscape of America morphs into one homogeneous string of strip malls? It's not comfortable to think about, but Fergus does his job and make us consider what might be coming. Matt Crawford is the outdoor editor of the Burlington (Vt.) Free Press and former editor at Grouse Point Almanac and Upland Almanac. He interviewed Fergus in mid-June. A Year Afield in the Blue Ridge Mountains. By Christopher Camuto. Published by Norton. 316 pgs. $24.95. Hunting from Home: A Year Afield in the Blue Ridge Mountains is a good book about nature and nature watching throughout the seasons as seen through the prism of one man on a 200 acre farm in the mountains of Virginia. But it is not the book it sells itself as either with its unintentionally misleading title or its oddly chosen cover art, a beautiful woodcock double over a setter painted by Brett James Smith. Unfortunately, there’s nary a woodcock within its pages. And hunting, at least as used in the book’s promising title, means a search for something authentic, not necessarily bringing home game, although that’s a part of it, too. Hunting, in the literal sense, plays a minor role in terms of book’s overall content, with what little there is focused primarily on deer hunting and just a smidge on grouse. Which is a shame, since the deer and grouse chapters are well focused. By sheer volume, this is primarily a nature book, with a lot of fishing -- and a bit of hunting -- thrown in for good measure. The reality is that the newest book by Gray’s Sporting Journal’s book reviewer Christopher Camuto has much more to do with creating a writer and the writing life than anything else. Writing is a recurrent theme of Camuto’s from the prologue to the final chapter. And while that is of some interest to me as a fellow writer, I’m not sure the writing life interests most readers. An old adage in the newspaper business is that readers don’t give a hoot about what it took to get a story, only that a good story gets into print. While he writes with clarity, introspection and intelligence, Camuto sometimes fails to simply deliver a good story filled with necessary tension, humor, revelation or insight. The fact that each of Camuto’s essays are about the same length, whatever the topic, made for an indistinct sameness in the material that didn’t move me along as a reader. Finally, Camuto’s repetitive use of a literary device -- italicized epilogues following almost every chapter -- tended to dilute their force, rather than emphasizing their strengths. Sometimes simply knowing when to stop writing is the most important element of writing. Rather than strongly making a point, revealing himself or coming to a conclusion, Camuto substitutes making layer upon layer of observation. The book’s weakness appears to be Camuto’s unwillingness to reveal his history and interior life that verges on diffidence. Distance works with reporting, but it doesn’t with a memoir or a personal essay. And that’s what Hunting from Home aims for without completely connecting. Camuto appears to be the sort of well-read but idiosyncratic fellow we’d all like to know better while afield: a man who prefers old pick-ups; hunts with a muzzle-loading shotgun; hunts over a mixed-breed setter/pointer cross; carries a Civil-War era Enfield; eats the same venison stew five nights in a row; listens to Spanish guitar masters and Miles Davis; and readily discusses Taoism and Martin Buber. Camuto recently moved from Virginia to northern Pennsylvania to teach at Bucknell University. I hope the new, yet familiar, landscape of the mountains allows him to open up in future works. And write a bit more about hunting. Kevin C. Shelly is a newspaper editor and freelance writer. 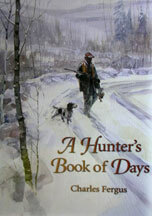 He is the author of Lynn Bogue Hunt: A Sporting Life, published by the Derrydale Press. He is at work now on a book with Brett James Smith. By Edmund W. Davis. Wilderness Adventures Press, Inc., 2001, 165 pages, $50.00 hardcover. Nearly a century ago, Edmund Davis, an ardent woodcock hunter blessed with a substantial inheritance and an Edwardian devotion to upland gunning, privately printed a scant 100 copies of his book, Woodcock Shooting. Long since out of print and quite rare, Woodcock Shooting has been made available to a new generation of wingshooters thanks to a special edition issued by Wilderness Adventures Press. Woodcock Shooting is that rarest form of sporting book—a “how to” so interspersed with engrossing stories that useful information is conveyed to the reader in an eloquent literary fashion best suited for an enjoyable fireside evening. With chapters, among others, focusing upon “The Birds,” The Dogs,” “The Gun,” “Shooting the Birds,” “Togs and Covers,” “Midday Meal,” “The Homeward Drive,” and “Serving the Bird,” Davis has pleasingly captured the essence of woodcock hunting in a slim, elegant volume. Finely presented in its slipcase graced with Brett James Smith artwork, containing an introduction by George Bird Evans, and sprinkled throughout with Smith etchings, this classic volume belongs on the shelf of every bird hunter. A true love of Nature fills Davis’ writing, and is powerfully expressed. Davis writes in the slightly stilted fashion of his day, interspersing lines of poetry throughout the pages, and hinting at the privileged shooting life enjoyed by scions of the Gilded Age. However, far from evidencing a mindset as a stuffy, self-absorbed patrician, Davis emotively describes the conflicting feelings upland hunters everywhere exhibit about killing what they treasure. Davis readily admits to little experience with the Southern range of woodcock, gleaning most of his expertise from years of hunting in New Brunswick. The first chapter, “The Birds,” portrays the arriving woodcock as the herald of Spring, and Davis provides the reader with basic details concerning the migration and courtship of the hearty travelers. Davis wisely introduces his subject matter at its most basic level, bringing the hunter into the habitat of his quarry and providing insight into the necessary foodstuffs. Interestingly enough, this first chapter is also where Davis falls off his horse, so to speak, with a foray into the folklore surrounding woodcock. The ancient tales that the female woodcock carries its chicks about in its claws, or even atop its back, and that woodcock self-treat wounds and broken bones with clay and feather daubed splints are relayed, although Davis largely admits he has never seen definitive proof of such acts. Davis redeems himself in following chapters, with basic discussions of the woodcock guns of his day, suggested bird dogs for woodcock, and a tutorial on shooting methodologies and appropriate clothing for both a gentlemanly shoot, and the backwoods briar patch. Journal entries recounting daily game statistics, and technological evolutions since Davis’ day, are the only indicators to the modern gunner that Woodcock Shooting was written in a bygone era. Perhaps the most endearing aspect of Woodcock Shooting lies in Davis’ intriguing chapters centering upon “The Midday Meal” and “The Homeward Drive.” For it is in these short sections of the book that the reader is brought away from the act of hunting itself, yet compellingly reminded of what calls us to the forest. Davis seats us before the noon campfire with its boiling teakettle, and again in the truck on the way home, entertains us with a discourse on classic mythology, and reminds us that we hunt for reasons in addition to the kill. As we stop to enjoy lunch and sip our tea, the babble of the brook and the wind in the trees calls to us, and weighty, yet pleasant, hunt-inspired ruminations later that day on our return to civilization evoke the hypnotic, mesmerizing lure of the hunt. “Serving the Bird” educates the palate and provides the reader with a brief glimpse into the refined table Davis must have enjoyed after his woodcock hunts. However, despite the descriptions of tantalizing dishes and accompaniments, Davis reserves his final gastronomic praise for perhaps the most simple preparation: roast woodcock. What grand discussions must have accompanied the dinners Davis and his fellow sportsmen enjoyed? One can only imagine. In 1904 Davis wrote a book on salmon fishing, and Woodcock Shooting was his second foray into the literary world. It would be his last. Sadly, in 1908 Edmund Davis was shot and killed in mysterious circumstances shortly after writing Woodcock Shooting, and the sporting world was deprived of a gifted and knowledgeable writer. Who knows what literary treasures might have sprung from Davis’ pen in years to come? One can only imagine.